Thoughts are already turning to the 2019 season, as Hyundai Motor and Dorna WSBK Organization are delighted to announce they will be joining forces next year, as the Hyundai i30 Fastback N will become the Official Safety Car of the MOTUL FIM Superbike World Championship. 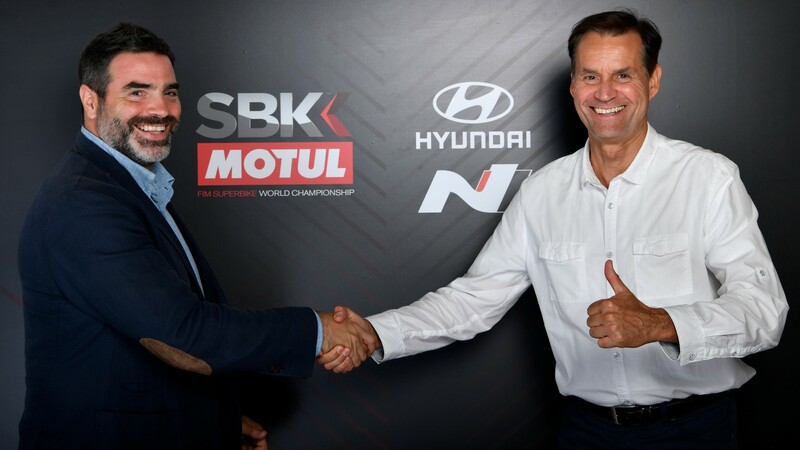 Signing the agreement will see the sensational Hyundai N the Official Car and Official Safety Car of the WorldSBK championship for three seasons, it’s a fresh step for the series. With headquarters in South Korea, Hyundai was born in 1967 and has grown to become one of the largest multinational companies in the world. With subsidiaries throughout the automotive industry, they are highly influential and are a strong supporter of the sporting world. Joining the world’s fastest production-based motorcycle world championship, the Hyundai N Brand are built with the goal to get drivers hearts racing. Producing an everyday sports car and building race track capability into the core DNA – it is a perfect match with WorldSBK. Keeping the loyal fan base involved in the WorldSBK paddock is an important value for Hyundai, and they will be welcoming fans to experience the feeling of the Hyundai N all around the globe.